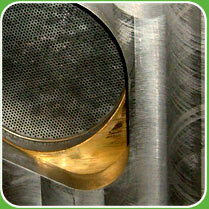 In general, a sieve separates the desired material from unwanted particles. These particles and undissolved elements are unacceptable for a high quality product and can disturb production. CP-Extrusion produces screen changers for a perfect filtration process without influencing the quality of the mass. CP-Extrusion screen changers come with 3 positions; Filter position, dump position, and by-pass position. The by-pass position is designed to establish zero downtime while changing or cleaning the screen. A new optional feature on the CP-Extrusion screen changers is back flush cleaning. In this position a small amount of the mass is used to clean the screen without removing the screen.